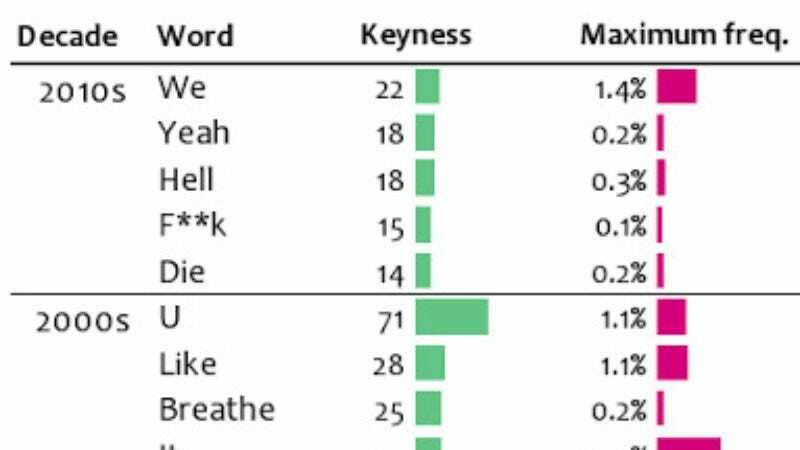 As part of the Internet-wide project to represent everything that has ever happened or might ever happen in chart form, someone has compiled a list of the most decade-specific words in popular song titles, from 1890 to present. “Decade-specific” means words that are used disproportionally in a particular decade. So “The” doesn’t crop up on the list because it’s used pretty evenly through the ages. But “Disco” comes up a lot in the 1970s, while ”Twistin’” was pretty much the exclusive provence of the ‘60s. The supposed coarsening of the culture is fairly apparent, as our current decade’s top five includes two curse words and “Die,” but keep in mind that women weren’t allowed to vote during the first four decades on the list, and we only ended segregation about halfway through, so all in all, the culture’s probably better off in the grand scheme of things.